Monday stock futures started the week lower... but they were lower the previous Monday and the market ended at new record highs. A weak Monday open only meant cheaper prices for the dip buyers when they finally decided to reveal themselves. The dip buyers did show up this week, even today with stocks crumbling, the dip buyers emerged, stocks rallied off their lows, but then buying momentum waned and the selling took over. Stock were all set to end 2014 on a high note. Wouldn't it be appropriate to end a year like 2014 at an all time high? We've had some 50 trading sessions end at a record high. Why not the last trading day of the year. Let's go into 2015 never better. Because thats what record stock prices mean.... right? The United States has never been better? If we've learned anything the last few years its that the stock market is less of a barometer for our economy than ever before... that's something I'll write about on another day. This week Greece had the worst market crash in its history. China's stock market fell over 5%, its worse fall since the financial crisis. Frankly I was surprised at the action heading into today. I think the trading action the last few months, since the last sell-off in October, has lulled everyone to sleep. Why hit the sell button when every single dip gets bought? Why sell when there is no where else to put your money? I think we'll find the answer to that at some point when asset prices collapse and we find ourselves begging it was only 2008 and we could just print our way back to prosperity. I don't like those on Twitter who Cry Wolf every single day, the sites that sell fear. But I do think at some point they will be right. The issue is when? Is it right now? Is the oil collapse more than just excess supply and shrinking demand? The sell off in October... was that the crack in the foundation? Stocks were falling off a cliff. How quickly we forget how nasty the selling pressure was. How many bear market articles were penned just two months ago. And then the market rebounded, it didn't look back. Until this week. The selling started Monday and it picked up steam today. I talked about it a few weeks ago. We need to keep an eye toward the Junk. Junk Bonds are crumbling. Guess where a lot of the Junk Debt is? 15% of the Junk Bond market and 11% of Investment grade debt comes from the Energy Sector. If the pull back continues the talk will start up about defaults. The dramatic decline in Oil prices, I didn't see anyone calling for it. On the other hand I see a lot of Monday Morning QB's saying how this is the new normal. I'm sure many wish they knew this about 6 months ago. My concern here, and what is likely going to spook the market, is what we don't know, but will l find out in the coming days and weeks. The firms that made ill advised trades in the energy sector. Like the $AAPL trade last Monday, when the stock flash crashed, it smelled like a liquidation. A margin call perhaps? Will we see more of these as firms rush to liquidate to cover their bad trades? Liquidations will send stocks lower, which could create a waterfall of selling. It's something to watch, however it's still early. Santa could very well come in to lift stocks to a record high on the last trading day of the year. 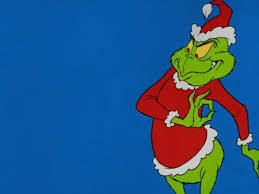 But for now the Grinch is stealing all the gifts and Who Pudding.